by Eric Hurwitz. Article posted 10/30/2016. 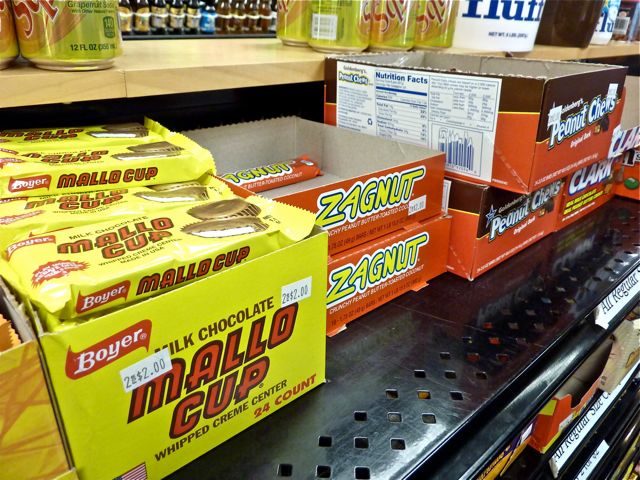 Perry Makarios owns one of the most unusual, but wonderful informal food destinations in suburban Boston: a bagel place, sandwich stop, and retro candy and soda pop shop under one roof where crowds frequently line up outside the door. SPoT! 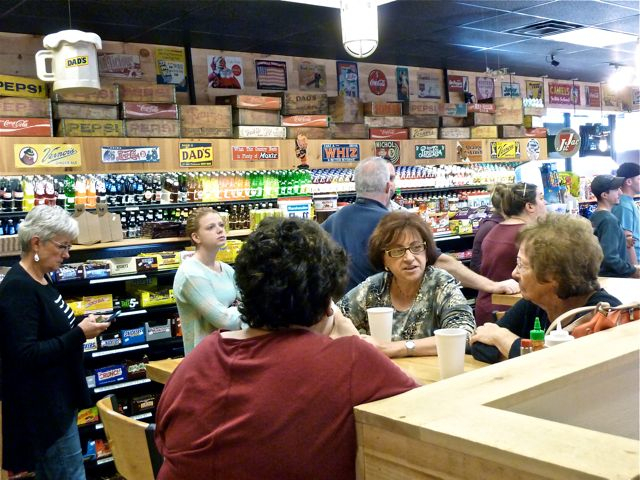 takes a small convenience store setting and somehow manages to bake and sell up to 2,000 bagels a day, create traditional and innovative sandwiches on bagels, offer more than 100 soda drinks, and showcase hard-to-find candies typically found in rural country stores. What’s more, the coffee selections are a big hit with the customers, too, including hot coffee, iced coffee, iced cafe mocha and a Rhode Island favorite, coffee milk. 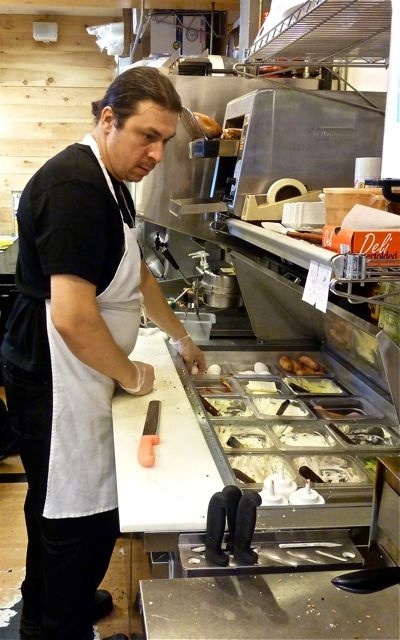 Makarios (pictured left), who grew up in the family pizza business, attended Babson College in Wellesley and once owned a chain of local bagel shops, has clearly applied his food industry background and business education to arrive at SPoT!, his dream business that started about 10 years ago. Makarios loves his job so much that he has no idea how many hours he works each week. “Asking me how many hours I work a week is like asking a parent how many hours a week do they take care of their kids,” said Makarios. “You do what you need to do and don’t count the hours. If you enjoy working at what you do, it’s more like a hobby. I love what I do for a living." That love takes on many appealing food offerings. For starters, SPoT! 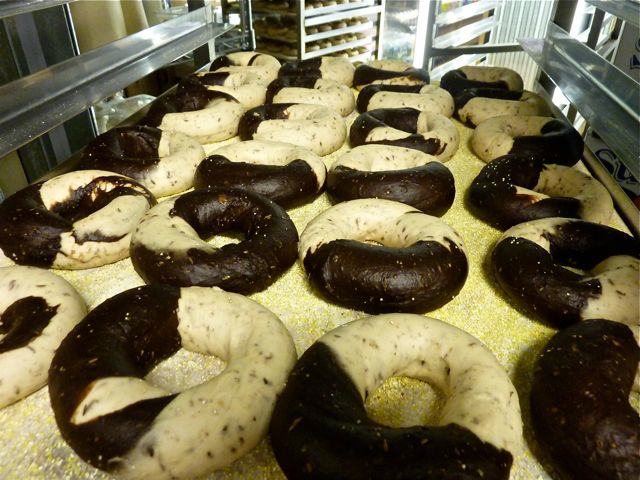 sells 16 varieties of bagels, including plain, sesame seed, poppy seed, cinnamon raisin and marble. With a large kitchen, Makarios takes ambitious steps to create the perfect bagel through a 20-hour process that includes proofing (making sure the yeast is active enough before cooking), an exact fermentation process and using high quality ingredients like premium gluten flour that is milled locally, and all natural cane and brown sugars. Makarios added that he has a commitment to keeping bagel prices low despite the long hours put in to create this popular, ring-shaped bread product. Before 3 p.m., the bagels sell for $5.99 a dozen, and after 3 p.m., at $4.00. While the familiar egg and bacon, and egg, bacon and cheese sandwiches remain best-sellers, the unfamiliar offerings have also become immensely popular. “The Beast” is comprised of ham, bacon, egg and cheese with maple syrup on a cinnamon sugar bagel. The “SPoT! Dog” consists of an all-beef grilled Coney Island hot dog, on a grilled sourdough bun, topped with peanut butter and cream cheese. 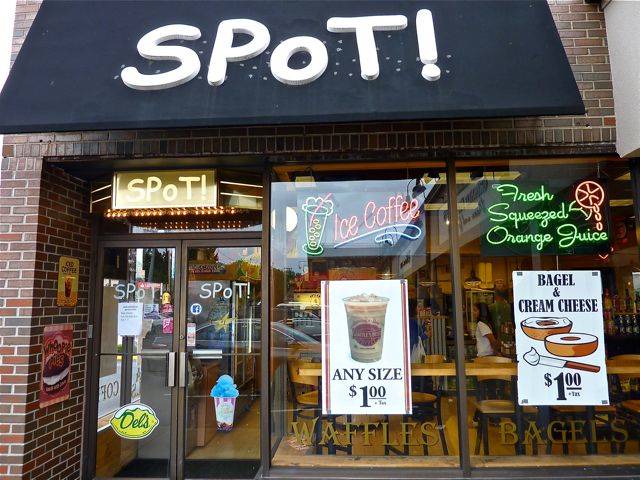 In addition to fresh bagels, SPoT! makes its own cream cheese, peanut butter, orange juice, and chicken and tuna salads on a daily basis. 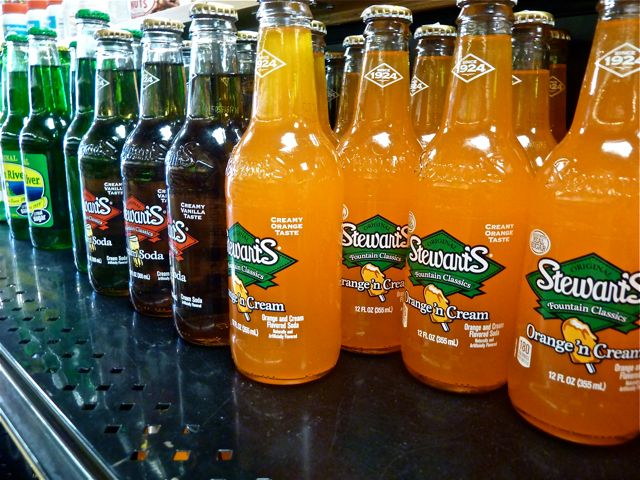 Adding fun elements like an fully-functional old-fashioned Boylan soda fountain machine, vintage candy and pop signs on the wall, and soda boxes throughout the store help make SPoT!’s appeal even that much greater. SPoT! 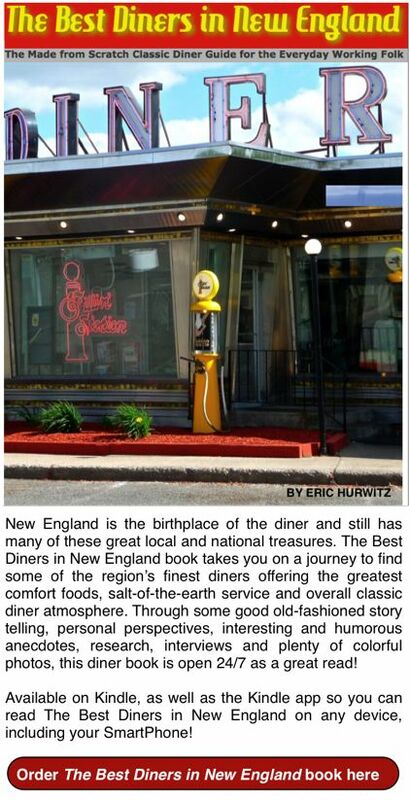 received a big lift a few years back when the local Phantom Gourmet television show featured the Norwood business in a five minute segment. After that feature aired, SPoT! soon found customers coming in from New Hampshire and Maine when visiting in the Norwood area, according to Makarios. SPoT! 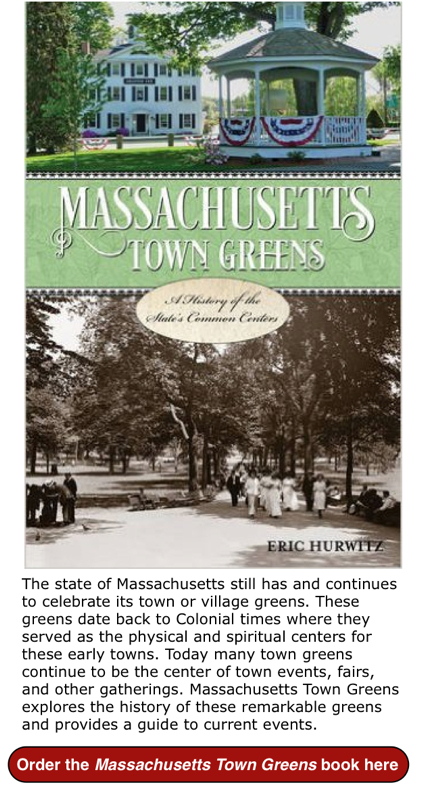 has also been a regular at the Phantom Gourmet Food Festival held annually in September. SPoT!’s business success clearly stems from Makarios’ personal career growth, overcoming challenges along the way, and a relentless determination. Surviving a bad economy, a no carbs trend fueled by the Atkins Diet, and not completing his Babson degree (“Many entrepreneurs never finished college,” he said) has driven Makarios to do even better. With only a short break from the food industry field to work as a helicopter pilot, SPoT! has taken flight after years of perseverance. At that this point, Makarios would love to expand the size of his business, given the crowds, limited seating space, and a wholesale business called Bagels by Perry that sells to local restaurants, colleges and country clubs. With all his business success, Makarios would never take SPoT! out of Norwood, though. SPoT! is located at 20 Broadway St., Norwood. Tel. (781) 255-7755. Hours: 6:30 a.m.-6:30 p.m., Tuesday-Saturday, 7 a.m.-4 p.m. on Sundays. Closed Mondays.